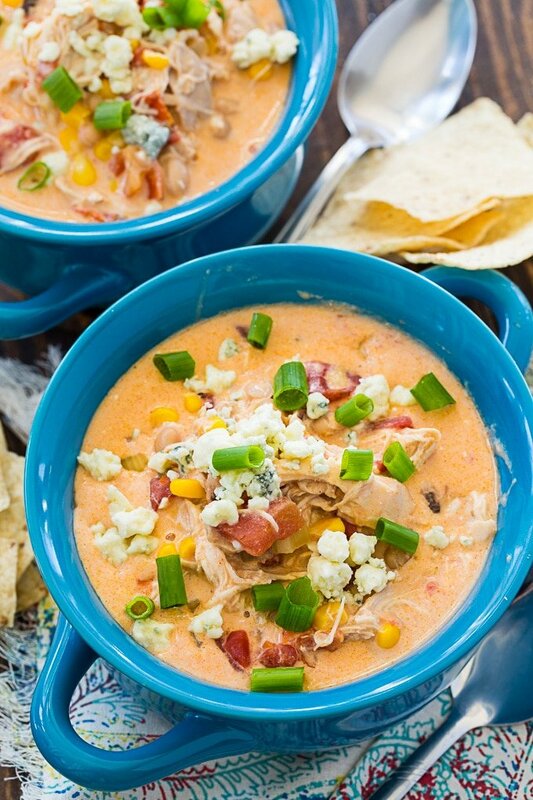 Crock Pot Buffalo Chicken Chili is a creamy and rich white bean chili with shredded chicken, corn, fire-roasted tomatoes, buffalo sauce, and blue cheese. It’s the soup version of Buffalo Chicken Dip and a bowl of this spicy chicken chili will warm you up on the coldest of days. Serve with a few tortilla chips on the side. 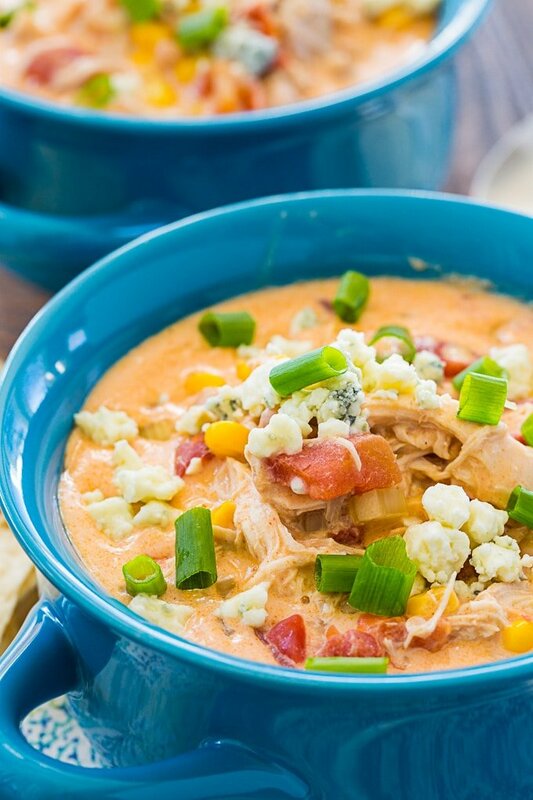 You’ll want to dip them into this flavorful, cheesy chili. A package of cream cheese makes this chili super thick, rich, and creamy. It gets added in towards the end so that it does not separate. No prep is needed for this easy recipe. Three boneless, skinless chicken breasts get added to a 6-quart or larger crock pot along with 3 cups of chicken broth, a can of fire-roasted diced tomatoes, 1 can of white beans (add a second can if you like lots of beans in your chili), a can of diced green chilies, 1 cup of corn, 1/2 cup of Buffalo sauce, a little diced celery, onion powder, garlic powder, and white pepper. Everything gets cooked on LOW for 5 hours. Add the cream cheese and cook on LOW 30 more minutes to melt the cream cheese. Shred the chicken, add some shredded Monterey Jack cheese, and stir everything well to get it blended. Serve with blue cheese crumbles and green onions sprinkled on top. Plus more Buffalo sauce if you want it spicier. 1 (8-ounce) package cream cheese, cut in chunks. 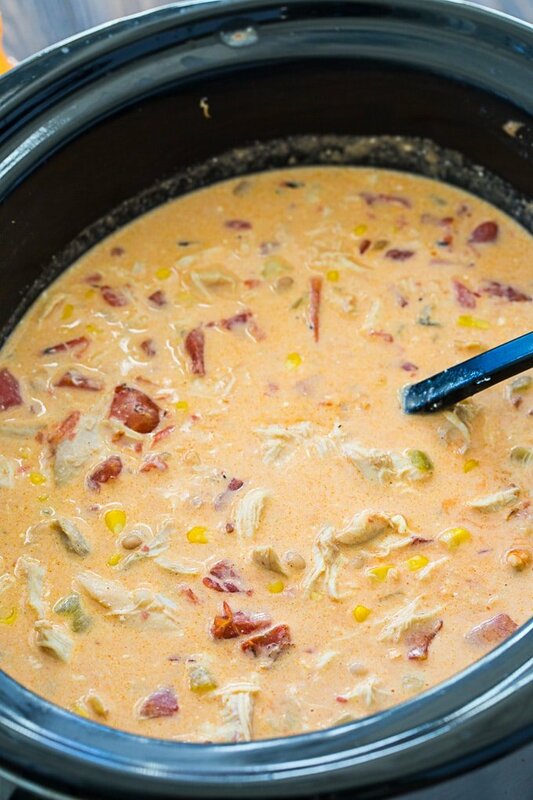 Combine chicken, broth, diced tomatoes, white beans, chilies, wing sauce, corn, celery, onion powder, garlic powder, white pepper, and salt in a 6-quart or larger slow cooker. Cover crock pot and cook on LOW for 5 hours. Add cream cheese and cover and cook on LOW 30 more minutes. 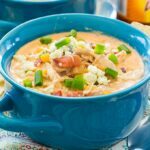 Open slow cooker and remove chicken. Add Monterey Jack cheese and sitr until cream cheese and Monterey Jack cheese are melted and blended in. Shred chicken and return to slow cooker. Dish into bowls and top with blue cheese crumbles and green onions. 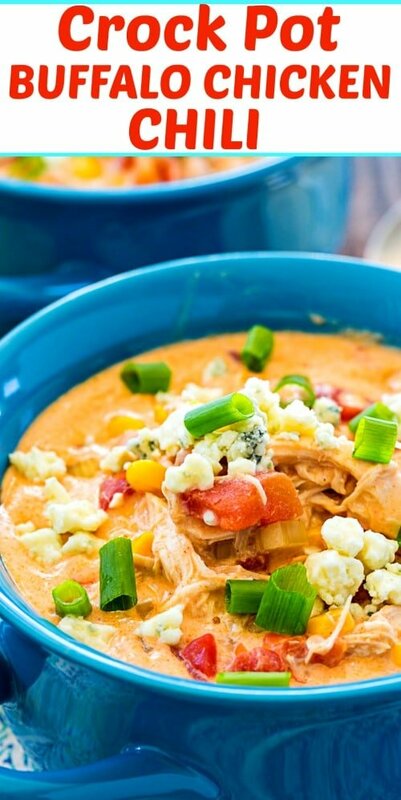 This entry was posted in Slow Cooker, Soups and Stews and tagged chicken, crock pot recipes. Bookmark the permalink.